Ride Along 1968 Mustang Zombie 222 ELECTRIC CAR! - Muscle Cars Zone! Ride Along 1968 Mustang Zombie 222 ELECTRIC CAR! We know this may be controversial for some of you. However, the future brings many things that we just simply need to embrace. The industry is focused on developing and introducing electric powered cars on the market like never before! Bloodshed Motors is one company that does it very good! They are committed on manufacturing the coolest and fastest all electric vintage muscle cars in the world! They call their creations – ZOMBIES! In this video you will be able to meet one of their creations which is called the Zombie 222! It is a ride along video of the Zombie 222 electric car and people are thrilled! When you think of it, Caroll Shelby had a similar concept like these guys at Bloodshed Motors. 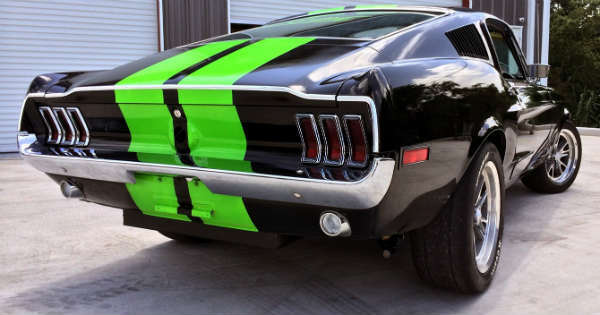 In the 60`s, he infused a stock Mustang with modern performance technology! The result was the mythical Shelby GT500! It looks like these guys are bringing this concept into the 21st century! They are taking the most renowned American muscle cars and fitting them with madly powerful all-electric propulsion! Up next, they enhance these legendary muscle cars with state-of-the-art braking and suspension technology! In the Zombie 222 electric car there are 2 engines, one of them at 222v and the other 200amp which equals 444kWs! Finally, click here to watch one amazing race between the electric titans. Zombie 222 vs Tesla P85D!